Under President Park Geun-hye, it has fostered a climate of police violence and impunity. Seoul—Inside the intensive-care unit (ICU) of Seoul National University Hospital, Baek Nam-gi, a 69-year-old farmer and lifelong political activist, lies in a deep coma. His skull is still partially open after his surgery last November, when he was rushed here after being knocked violently to the ground by a burst from a high-powered water cannon deployed by the police forces of President Park Geun-hye’s government. They were trying to block a massive demonstration of 130,000 people in downtown Seoul protesting Park’s labor and trade policies. I am here with Doraji Monica Baek, his eldest daughter, a slim, quiet woman who works as an editor for a local publisher of novels. She has asked me to accompany her to the ICU to visit her father. Baek had read my article in The Nation last December about the events that brought her father here as part of her family’s quest for justice. I feel a mixture of sorrow and privilege as we stand quietly by his bed, where he lies motionless except for the deep heaves in his chest as a machine forces him to breathe in and out. I touch her arm, and she places her hand on mine. There are no words at moments like this. Mr. Baek, whose prognosis is not good, has become a symbol to many Koreans of the increasingly harsh response of the Park government toward dissent. In particular, people are angry and disgusted with police violence and a climate of impunity in which the government refuses to take responsibility for the actions of police officials. In Baek’s case, Park’s government has never apologized to his family and, according to human-rights activists, promoted officials involved in the November incident, including the police commander who ran the operation that day. “The one time I went to the prosecutor’s office, nobody from the government said anything to us,” Ms. Baek told me in a waiting room outside the ICU. The only officials who have asked about her father, she said, are the detectives from the downtown Seoul precinct who are investigating the case. At one point, she said, the Seoul police commissioner asked to come see her father in the hospital. “I said, if you have no apology, please don’t come.” He didn’t because “he was never intending to apologize,” she said. Ms. Baek’s family, with the help of human-rights lawyers, filed a civil lawsuit against the police for causing their father’s injuries. She has seen official surveillance footage of the November demonstration and has concluded that the police officers manning the water cannons deliberately targeted her father. “They pointed at him and shot—I could clearly see that,” she told me. The cannons also included large amounts of capsaicin, an active component found in chili peppers, which produces a sensation of burning and is often mixed with tear gas here. “The water was white; it was not transparent,” said Ms. Baek. Union leader Han Sang-gyun, charged with unlawful assembly and obstructing traffic, has been in prison since December. Her family’s lawsuit, which seeks compensation from the government and six police officers, was dismissed in March, and will soon be heard by an appeals court in Seoul. The family recently met with three South Korean opposition-party leaders to seek a hearing in the National Assembly about the government’s actions that led to Mr. Baek’s injury. The politicians, representing the Minjoo Party of Korea, the People’s Party and the Justice Party, agreed to appoint a special prosecutor and pledged to sponsor hearings to investigate excessive use of water cannons by police. Meanwhile, the chief organizer of last fall’s demonstration, Han Sang-gyun, the president of the Korean Confederation of Trade Unions, remains in prison. He was arrested last December on charges of violating laws on assemblies and obstructing traffic, and his trial continues this week at the Supreme Court in downtown Seoul. 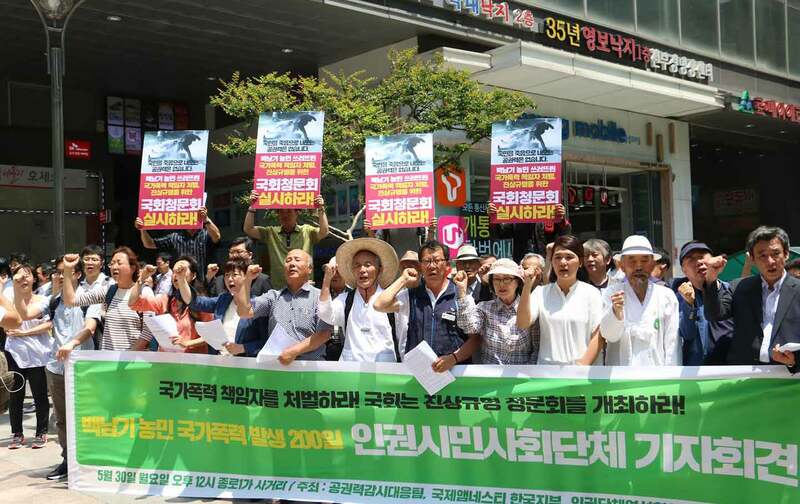 The Korea chapter of Amnesty International has been closely monitoring the situation of the labor leader and his farmer ally, and was one of the organizers of the demonstration this week. “Baek’s case is symptomatic of a deeply worrying trend in which the space for public expression and dissent in South Korea is shrinking,” Catherine Heejin Kim, Amnesty’s local director, wrote recently in the Korea Times. “Police routinely employ excessive force to disperse large demonstrations with little accountability to those whose rights are trampled in the process.” Baek’s case will be discussed before the United Nations Special Rapporteur on the rights to freedom of peaceful assembly and of association, which meets in Geneva on June 17, an official with Amnesty Korea told me. This past January, following a visit to Seoul, the UN rapporteur, Maina Kiai, issued a statement critical of the Park government. “I sense a trend of gradual regression on the rights to freedom of peaceful assembly and of association—not a dramatic shutdown of these rights, but a slow, creeping inclination to degrade them, ” he wrote. “Even the courts which should always interpret laws in favor of rights have recently been moving towards restricting rights rather than expanding them. ” The People’s Solidarity for Participatory Democracy, one of the largest human-rights groups in South Korea, provided a detailed report to the UN about political conditions in the country while Kiai was in Seoul. The story of this injured farmer-activist is, in part, a story of South Korea’s emergence from authoritarian rule. Baek Nam-gi represents thousands of people of his generation who spent decades fighting for democracy, dating back to his days as a student under President Park’s father, the military dictator Park Chung-hee. During the 1970s, Baek was arrested several times for violating various decrees against public protests. On May 17, 1980, following Park’s October 1979 assassination, the South Korean general Chun Doo-hwan declared martial law throughout the country, and Baek was arrested again. He was sentenced to two years in prison and released on parole in March 1981. Upon his release, Baek returned to his family’s land in the town of Boseong near Gwangju, the southwestern city that was the scene of the May 1980 uprising against Chun’s martial-law forces. He became a farmer, growing rice, beans, and wheat, and later became a leading figure in the Korea Catholic Farmers Movement. It was in that capacity that he participated in last November’s demonstration, which was protesting free-trade policies that have allowed massive imports of foreign grain into South Korea, lowering the price of local goods. At the hospital, Ms. Baek recounted his life to me. “As a father, he was very warm, and loved his children so much,” she said. “He had great honesty, and good judgment.” After the Gwangju uprising, news of which was suppressed by the South Korean government for years, he obtained videos of the events and showed them to local villagers. “Many people gathered in my house at that time,” she recalled. 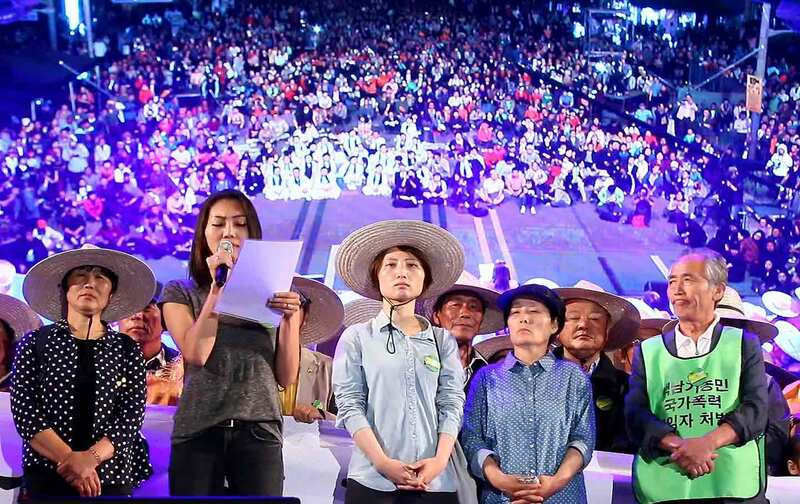 The Baek family returned to Gwangju earlier this month to mark the 36th anniversary of the 1980 uprising, and were introduced to local citizens at a raucous “Eve of May 18” celebration that I attended as well. Meanwhile, she visits her father almost every day as he lies with severe brain damage in the hospital, a victim of political violence in a country that has seen far too much tragedy over the past half-century. Editor’s note: This article has been corrected to reflect the fact that Doraji Monica Baek is Baek Nam-gi’s eldest daughter, not youngest.